For all dog lovers, the new must have home accessory is a dog doorstop. 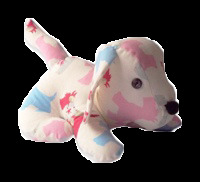 Our luxury range of doggy doorstops are all handmade to order for us here in Britain. Choose from a lovely range of different fabrics and patterns, some are made with Clarke & Clarke fabrics. Perfectly weighted, these dog shaped doorstops will look lovely in your home and serve their purpose. They are undoubtedly much more attractive than that old wooden block! Our dog-shaped doorstops make the perfect gift for all dog lovers. At Chelsea Dogs, we’ve found a lovely supplier who hand makes each and every dog doorstop for us here in the UK. Choose from a wide range of stylish fabrics and we’ll have your doorstop made up, wrapped up and in the post to you. We also have the classic pyramid shaped doorstops which can be made in any of our fabrics including our pink Scottie Dog and taupe Scottie Dog fabrics. All our dog doorstops come pre-stuffed so all you have to do is decide which door it will sit by.